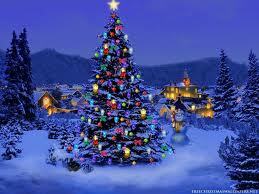 Christmas is a traditional holiday among Christians and some non-Christians as well. According to History dot Com, Christmas is both a sacred religious holiday and a worldwide cultural and commercial phenomenon. For two millennia, people around the world have been observing it with traditions and practices that are both religious and secular in nature. Christians celebrate Christmas Day as the anniversary of the birth of Jesus of Nazareth, a spiritual leader whose teachings form the basis of their religion. Popular customs include exchanging gifts, decorating Christmas trees, attending church, sharing meals with family and friends and, of course, waiting for Santa Claus to arrive. Just as early Christians recruited Roman pagans by associating Christmas with the Saturnalia, so too worshippers of the Asheira cult and its offshoots were recruited by the Church sanctioning “Christmas Trees”. Pagans had long worshipped trees in the forest, or brought them into their homes and decorated them, and this observance was adopted and painted with a Christian veneer by the Church.